1) Download an application here. 3) Scan your completed application and send it to us via email at info@cjsupperdeck.com, or you can bring it in to our establishment (Find Us). Server: Enjoy serving others the way you would like to be treated. This position includes taking food and drink orders and creating a comfortable and friendly environment for our customers. Bartender: Take food and drink orders for the patrons at the bar, mix drink orders for the servers, and check ID's for customers seated at the bar. Bartenders are the most customer interactive personel on staff. Bar-back: Aid the bartenders on busy nights by stocking the coolers, ice, and other bar supplies. Station Chef: This position includes preparing food orders in a quality and timely manner. 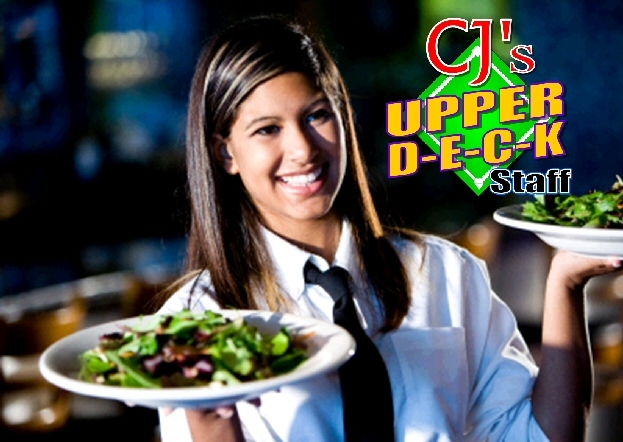 CJ's is known for great food at affordable prices, our chefs work hard to keep up this reputation by creating new specials daily and preparing items fresh. Host/Hostess: The first person to interact with the customer! This position is includes greeting the customer, ensuring they are approached by their server, and maintaining the reservations, menus, and daily specials. Floor Staff: Responsible for checking ID's at the door (after 9pm) and maintaining a friendly enviroment for all clients to enjoy.